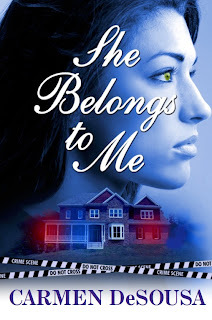 Here is an excerpt from one of my favorite scenes in my bestselling romantic suspense, She Belongs to Me, as I believe every woman can identify with the first time, wondering if she is safe mentally and physically, and yet, her heart is still pounding out an uncontrollable rhythm in anticipation as well. The latch clicked loudly into place, making her jump. What had she done? Could she really trust him? Jordan took her hand and led her to the sofa, pulling her down beside him. Her heart started beating out an uncontrollable rhythm. Dear God, she prayed silently, please don’t let him hurt me. She knew he wouldn’t hurt her physically; it was the mental agony she couldn’t handle. His smile was wonderful, too good to be true. He didn’t sound like a marine or a cop. He looked every bit the tough guy but was a hundred percent gentleman and romantic simultaneously. Though her heart continued to race in her chest, it wasn’t out of nervousness anymore, but anticipation. Aw, this is lovely. I like the contrast between the physical and mental/emotional. Ah, those firsts :) Hope it goes well for her. Love the internal conflict, but her willingness to go for it! Great six. Isn't that always the case. LOL! You know I enjoyed this novel! Nice to revisit the characters today, terrific snippet! Great six Carmen. I can't wait to read it! Great peek into her turmoil and congrats!